It hasn’t been so bad though; there’s been lots of summer rain storms to cool things down a bit, and the four-day 90-degree heat wave seems to have subsided...for now. I am working away at my two jobs this summer (part-time Office Manager, part-time at a restaurant). I’m also proud to announce my next job: I will be teaching again in the fall semester! I recently signed on to be an Adjunct Professor in the Theatre Arts Department at Marymount Manhattan College on the Upper East Side. Some of the faculty there are former students of my professors from South Carolina, so it’s nice to be keeping the “family” together! I started on the first day of Summer, June 21, 2017. I record myself doing one monologue a day, often while I’m on the go. I do it in one take, no editing, and post it on YouTube. I then share the links on my Facebook and Twitter pages. I want to keep my creative juices flowing, and in this business, I often have to “put myself on tape,” so this is good practice. 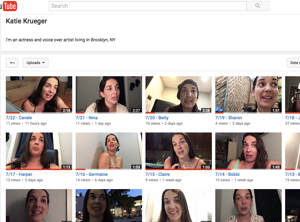 Plus I have a plethora of facial expressions, and I love how YouTube’s algorithm chooses the particularly silly ones. It’s a fun challenge, and I plan to keep it going all summer, which adds up to 90+ total monologues! I’ve gone through my “bag” of memorized pieces and have used others I found in the past, but perhaps never tried at an audition. I read a lot of plays, so I’m always on the hunt for new material. Suggestions from my readers are also welcome! If you’re not on social media, you can subscribe to my YouTube channel to follow along, or check back on my Summerlogues link above! April 24 - I performed in First Draughts with AMIOS in a staged reading of a new full-length play, developed from a previous short Shotz play. I played PATIENT in Liz Morgan’s Deliver: Letters to the Motherland from a Foreign Body. May 10 - my Pantsface (my boyfriend, Will) flew to New York so we could celebrate our ten-year anniversary watching the SF Giants play the NY Mets. The Giants won, of course. (I attended the previous two games with the Finnerty’s Game Bus, but the outcomes were not so great). We spent the rest of the week together, and it was absolutely lovely. May 27-30 - Memorial Day Weekend in Hagerstown with my sister and her family! June 5 - I performed in Brave New Shotz with AMIOS, playing a Bro-y Male DOCTOR, proudly wearing a fake mustache. There is lots of summer left to go, so I’ll keep working, keep practicing and auditioning as much as possible. I have a two-week class with a Casting Director coming up, and I have begun training for my next half marathon in October (Brooklyn Rock ‘n Roll Race!) Onward! Stay cool, my friends, and thanks for your continued support! Krueger Sisters reunited in Maryland!